A new store has opened in Sconset Square. You can drive to its grand opening tomorrow. Better yet, you can run. Fleet Feet is family owned and operated — part of a network of specialty running, walking and fitness stores across the country. Owners Dave and Lynn Wright have been (duh) runners for decades. She is recreational; he’s more competitive, running every distance up to marathons (including Boston, New York and Chicago). They have 2 grown children, and 4 grandchildren — some of whom already run. 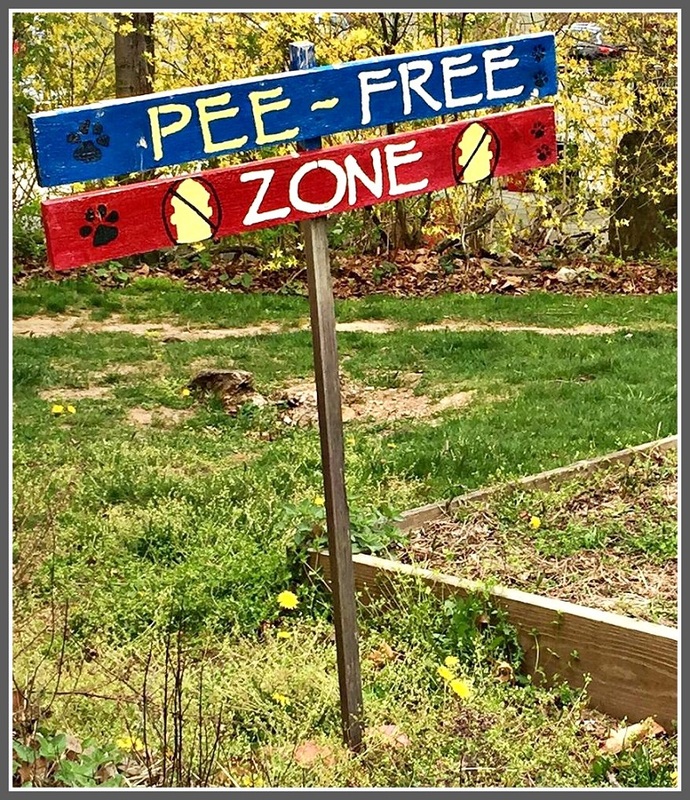 From their base in western Massachusetts, they began exploring options. Fleet Feet — which had a store in Longmeadow, where they lived — seemed like a perfect fit. Two years ago the Wrights began looking for markets in this area with a similar feel to Longmeadow. But the place had to be more than a good business location. It had to feel like home. After spending a day at Compo Beach in August, they rode their bikes around town. Then they walked Main Street. Till then, they’d only driven through here, on I-95 or the Merritt. Suddenly, Westport was on their short list. They discovered Sconset Square accidentally, after searching online for smaller retail spaces. They came down on a beautiful late summer day, and instantly knew it was right. The small, funky shopping center was just starting a face-lift project. It was affordable, and large enough for the Wrights’ plans. They loved the landlord. The lease negotiation was short and easy. Four months later, they opened. Runners have embraced them — even during the coldest days of winter. “We are excited to see how many people we can help through walking, running and living a healthy lifestyle,” Wright says. Tomorrow’s grand opening “runs” from 8 a.m. to 4 p.m. There’s music, and a fun run/walk (3- or 5-mile routes) at 9 a.m. Check out the running footwear, apparel and accessories. Learn about injury prevention products, and walk/run programs for every ability. Oh, yeah: Jr. Deli’s food truck will be there. Whether you’ve run a few miles or driven over, there will be plenty to eat. Fleet Feet is filled with running gear, and accessories. In 1955, Francois duPont opened a jewelry store. Twenty years later, he took it to Main Street. In 1980, Francois’ son Noel took over the business. It was one of Westport’s go-to places for beautiful items, handsome watches, and of course that quick replacement watch strap or battery. A few years ago, Noel moved around the corner to Sconset Square. “He lit up the square with his smile, and his weekly visits to each shop to check in,” says neighbor Tracey Heinemann. He was a constant and beloved presence — always accompanied by his Yorkie-poo Ollie. Two weeks ago, Noel duPont died suddenly at home. He was 59 years old. The Staples High School graduate had attended Berklee College of Music. A gifted drummer, he was passionate about the music of his idol, Frank Zappa. He also loved skiing, swimming and hiking in Maine. He leaves behind his wife of 20 years, Julia, and sons Maxwell and Lucas. 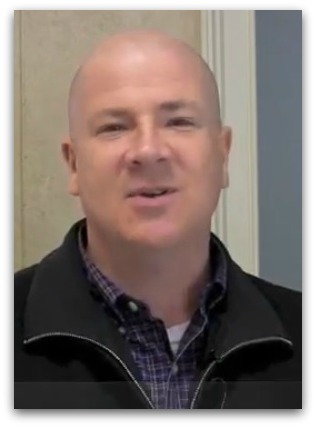 A celebration of Noel’s life is set for Saturday, January 5 (Tavern on Main, 1 to 4 p.m.). As is sometimes the case, a business cannot survive the death of its owner. Julia is liquidating Francois duPont Jewelers. This weekend and next, all jewelry is 50% off. It’s a bittersweet time for Noel’s fellow merchants in Sconset Square. They’re busy preparing for next Thursday’s Holiday Stroll. From 5 to 8 p.m. on December 6, the popular shopping center on Myrtle Avenue — nestled between the Post Road, Christ & Holy Trinity and Church Lane — will be filled with holiday singers. The Little Red Waffle Truck will sell food. There are prizes too. Each store has something special. Swoon offers festive English treats, and shows off seasonal floral deocrations. Bungalow serves aperitifs, along with tarot card readings. Bespoke Designs features champagne and savory snacks. Kerry Rosenthal has festive nibbles and toddies. Roots Salon gives discounts on artwork, and a chance to win a free service. At Le Penguin there’s happy hour prices, complimentary bar bites, and singer Antoine Blech. Francois duPont Jewelers, in Sconset Square. Of course, Francois duPont Jewelers will be open too — for one of its last days. Amid all the merriment, his many friends will be thinking of the popular, ever-smiling, aptly named Noel duPont. Mention “downtown shopping,” and Westporters think first of Main Street. That’s long been our retail heart. But it’s not the only one. 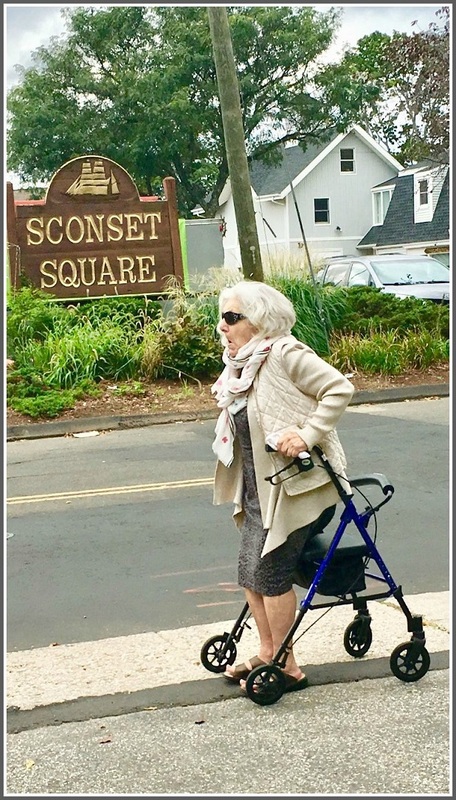 For more than half a century, Sconset Square has sat happily — and with plenty of parking — just a few yards from Main Street. It’s attracted local merchants, with a variety of offerings. Its stores (and restaurants and services, like tailors) have loyal clienteles. Sconset (which started life as Sherwood) Square is an often-overlooked, and quite successful — piece of Westport’s retail puzzle. Wende Cohen is one of those long-time merchants. But she did not set out to be one. More than 2 decades ago she moved here from New York City for the usual reasons: 2 kids, more room, beaches, golf, the schools and community. Wende had worked in magazine ad sales, before turning to her next job of raising kids. But her mother-in-law was in the antiques business, and when Wende traveled with her on European buying trips, she was hooked. 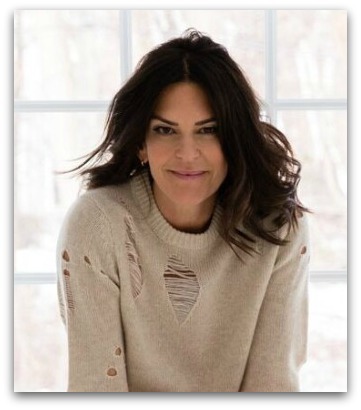 More than 2 decades ago — while still in her 20s — she opened a store called Bungalow, in the former Brandman’s Paints in Sconset Square. She loved being part of the small shopping center. There was a camera store, a travel agency and more. Through the shop she met people outside her “circle of mom friends”: decorators, summer people, empty nesters. Wende’s first container sold out in months. She went back to Europe, and returned with more unique items. 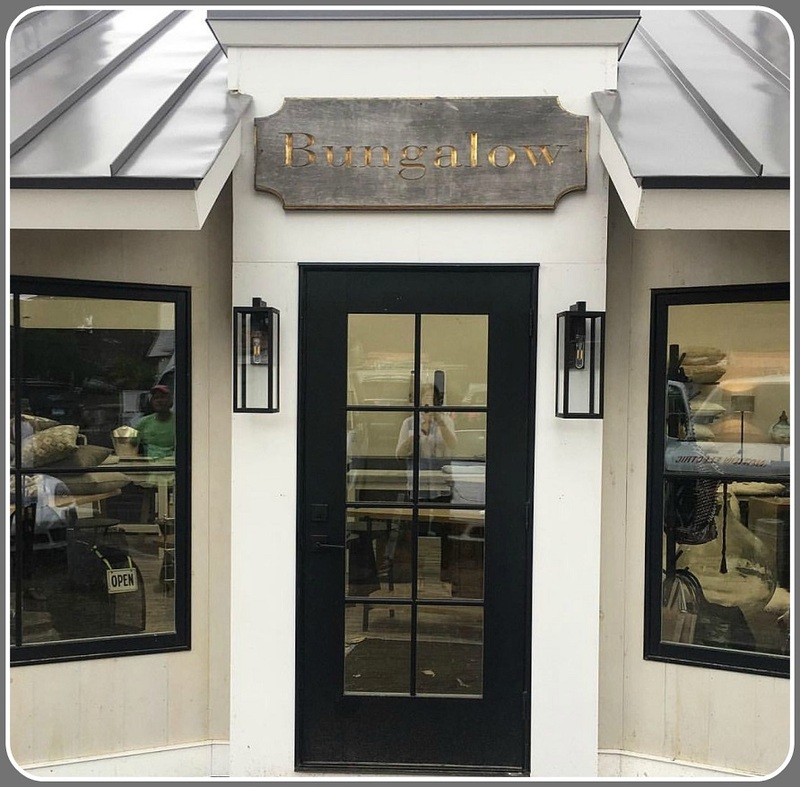 Over the years, Bungalow added gifts, jewelry, books and cashmere. It morphed into a “lifestyle store.” Wende expanded, and with the help of landlord David Waldman renovated her place. Her merchandise is a mixture of old and new, with prices from $8 to $8,000. She works hard finding special pieces. She celebrates local artists, with pottery, photos and paintings. And — as a small businesswoman — customer service is important. Wende lets people take items home, and see how they fit or work. In the store itself, she’s got a space in back where she’ll open a bottle of wine, or have an espresso. Le Penguin — a couple of doors away — sends over lunch on china. She’s not immune to the winds of change sweeping retail — particularly the internet. So she’s making sure she does not sit still. Recently, Bungalow renovated its space. It’s airier, more open. There are new high ceilings. Sconset Square has been around for a while. So has Bungalow. Both are success stories, in a Westport retail environment that needs some good news. But another mystery remains: Why the name? No one answered that question. If you’ve got a clue, feel free to comment here. Vanessa Bradford, Rich Stein, Elaine Marino, Michael Brennecke, Don Chambers, Jill Turner Odice, Edward Bloch, Mary Cookman Schmerker and Seth Braunstein all knew exactly what the photo showed. 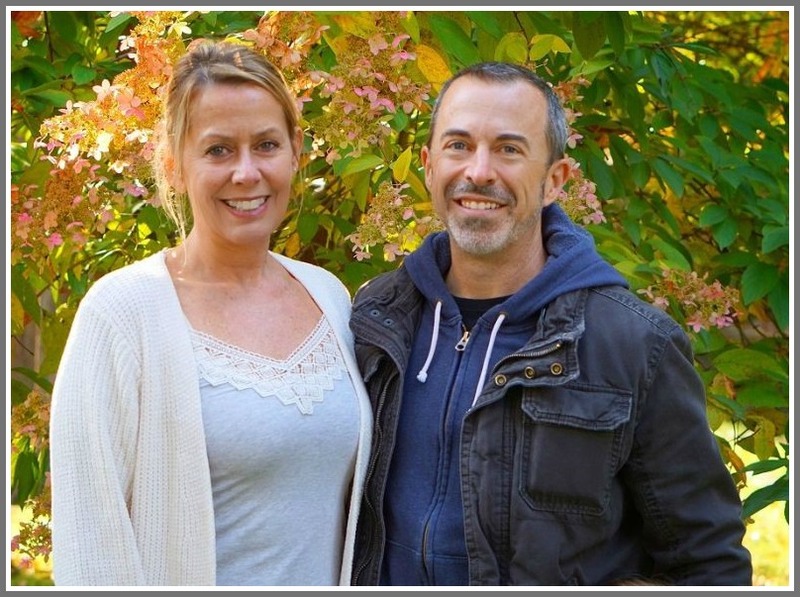 Fred Cantor, Amy Ancel and John Terpening came close — but had the wrong side of the Post Road. Here is this week’s challenge. If you know where in Westport it is, click “Comments” below. Sconset Square is seldom in the news. But now — as the small Myrtle Avenue shopping center seems poised for redevelopment — Westporters suddenly see it with new eyes. It’s been around a long time. 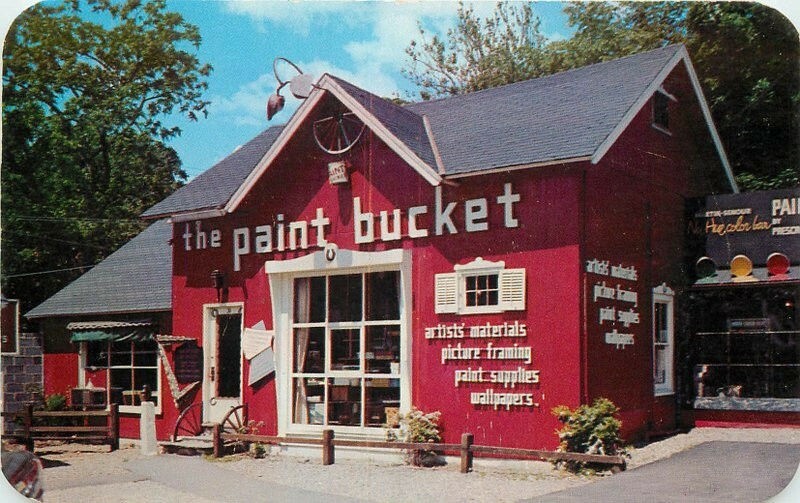 Originally called Sherwood Square — a name with far more historical meaning here than the faux-Cape Cod “Sconset” — it included stores like the Paint Bucket, in this 1966 shot. The view above is toward the west (Church Lane). 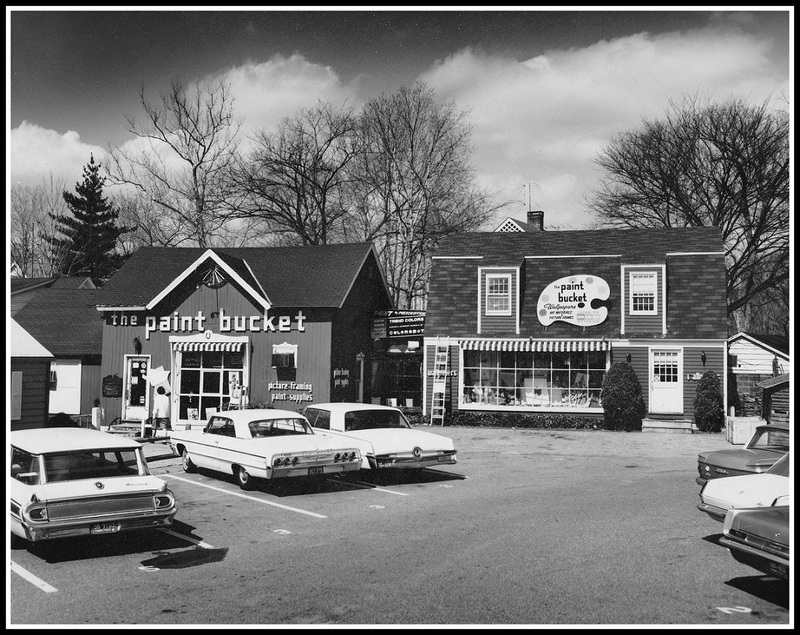 As photographer Peter Barlow notes, it was an anchor store that sold many kinds of paint, decorating supplies and picture frames. It also featured an art gallery — and that very cool “palette” sign. In later years, these buildings became CamerArts. And wasn’t Carousel toys in there at one time too? Sunday’s post described a new vision of downtown Westport. It explained that David Waldman — the Westport-based developer who conceived of and completed Bedford Square — is under contract to buy both Sconset Square and 155 Post Road East. They’re contiguous properties: Sconset is the small shopping center off Myrtle Avenue with stores like Bungalow and Le Penguin restaurant, while 155 Post Road is the cement building across from Design Within Reach (the old post office). 155 Post Road East, across from Design Within Reach (the old post office). That story generated a decent number of comments. But because Sunday was Easter — and the most beautiful day of the year — it may not have reached every “06880” reader. And not everyone with an opinion might have responded. A few town officials asked if I thought the comments posted — generally positive, some not — reflect the feeling of most Westporters. So here’s another opportunity to respond. Click “Comments” below. This is far from the final word, of course. But on a matter like this, the more voices, the merrier. Sconset Square. Redevelopment of the area could open the backs of the existing stores to shoppers too. Bedford Square Is Complete. Another Intriguing Project May Come Next. Since it opened 2 weeks ago, Bedford Square has become Westport’s newest destination. Folks flock there to shop, eat, and hang out in the courtyard. David Waldman’s project — which took many years to conceive and sell to town boards, and another 2 years to construct — seems like the end of a long process. But it may be only the beginning. Numerous sources say that the Westport-based developer is under contract to buy both Sconset Square and 155 Post Road East. 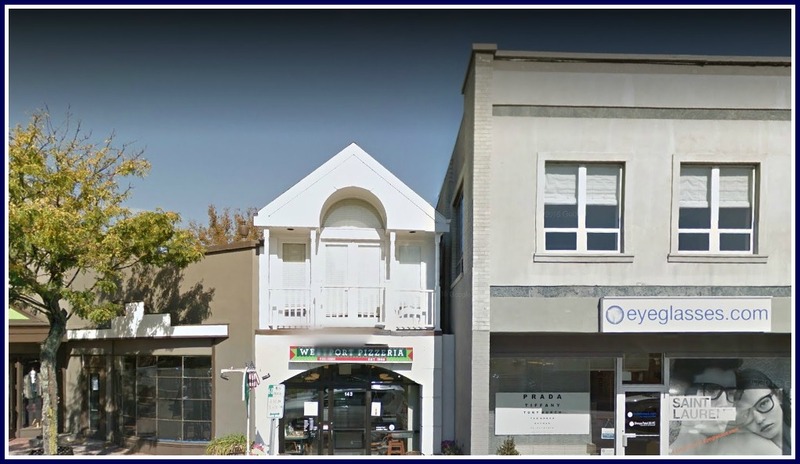 They’re contiguous properties: Sconset is the small shopping center off Myrtle Avenue with stores like Bungalow and Le Penguin restaurant, while 155 Post Road is the cement building across from Design Within Reach (the old post office). Eyeglasses.com is a current tenant; it used to house the Tack Room and Christian Science reading room. 155 Post Road East is a tired-looking building across from Design Within Reach (the old post office). With Bedford Square, Waldman re-imagined the way we use Elm Street/Church Lane/Main Street. If he acquires those nearby properties — and, rumor has it, the Westport Pizzeria building too — he could redesign that section of downtown as well. And tie it together with Bedford Square, which is much closer physically to Sconset Square than most of us now realize. Sconset Square has been in Westport for years. Originally called Sherwood Square, it was the site of the original Sport Mart. Word on the downtown street is that Waldman could reorient Sconset Square, opening up the backs of those stores to anyone using a redesigned walkway from the Post Road to Church Lane. Removing the Westport Pizzeria building could create a pedestrian walkway to Church Lane — and enable merchants to utilize the backs of their stores, as well as the fronts. He could also consolidate several of the parking lots on Church Lane — like the one behind SoNo Baking (soon to be Aux Delices) — making them more accessible and practical. Right now there’s a hodgepodge of small parking areas off Church Lane, and behind Sconset Square. It’s tough to walk there from the Post Road. 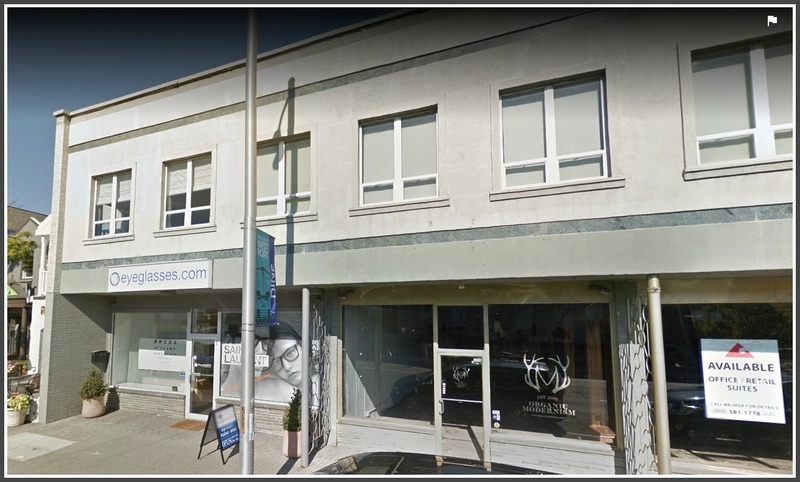 Other rumors are flying, including the possibility of the Westport Arts Center and/or Westport Film Initiative moving into 155 Post Road East. That could give those organizations great visibility — and bring more people downtown. The synergy between arts, retail, restaurants (and the new Bedford Square rental units) sounds exciting. Of course, Bedford Square did not happen overnight. It took many long nights of meetings. Followed by 2 years of construction. Westporters have so far voted with their feet. They’ve poured into Bedford Square. There are sure to be many votes ahead for this next phase of downtown development. A few times a year, a 40-foot container pulls into Sconset Square. It’s filled to the brim with European artifacts, antiques and goods. 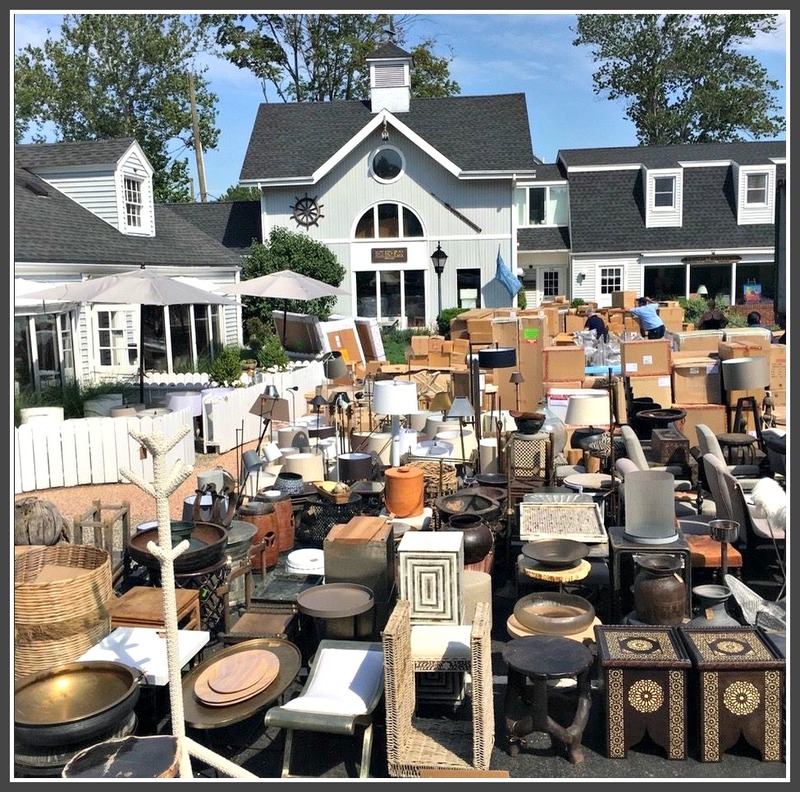 Within a day, Bungalow — the very cool shop crammed full of furniture, home accessories, art, textiles, jewelry, books and gifts — is emptied. All the new stuff comes in. Then everything is rearranged. Good thing it didn’t rain. Two feet is really a lot of snow. Compo Beach, as it's seldom seen. It’s also a ton of snow to get rid of. So far, our plow guys have done an amazing job. Many roads are already cleared to the pavement. The shoulders are another story — we’ll deal with that tomorrow. In the meantime: THANKS to all who helped dig us out so far. Rockwell Framing, framed by Sconset Square snow. The traditional pile at the corner of Post Road and Main Street seems even more imposing than usual. Private plows have not yet dug out the hair and nail salons on Church Lane at Myrtle Avenue. They're not the only ones. Got a snow photo to share? Send to: dwoog@optonline.net. Show us what you’ve got!